Our philosophy: We contribute to world progress through the creation of advanced technology and products. Research and development (R&D) is the only way for SEL to contribute to the world’s progress. Technologies which are the fruits of our R&D are conveyed to the world in the form of patents, reaffirming SEL’s position as an R&D company. By obtaining and licensing patents, we can protect Japan’s sophisticated technologies. As Japan is a country with very few natural resources, we are convinced that the key to the advancement of our society is inventing new technologies. We are determined to contribute to the development of Japan, while also introducing our state of the art technologies to the world. We are very confident that the technologies we invent will shape the future of the planet. Our business is the R&D of transistors and semiconductor devices using oxide semiconductors; R&D of materials and devices for liquid crystal, EL, and batteries; R&D of display devices using the materials and devices, and R&D of integrated circuits and rechargeable batteries, and further patenting of inventions and exercising of patent rights. 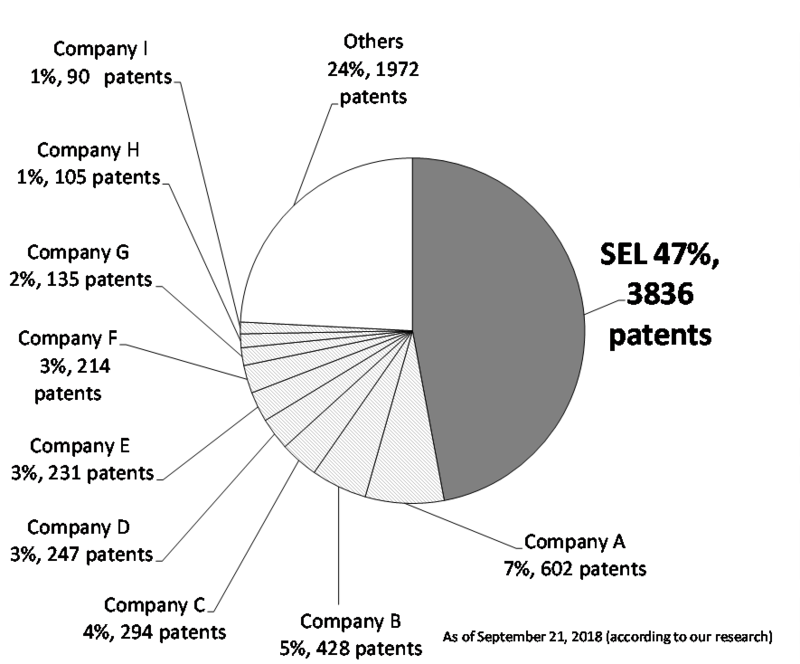 SEL was established in 1980, aiming to contribute to the world’s progress by spreading the fruits of innovative research and development to answer the needs of our every changing society. SEL’s core philosophy is “progress based on creation” which is a teaching of Dr. Yogoro Kato, the mentor of President Yamazaki. 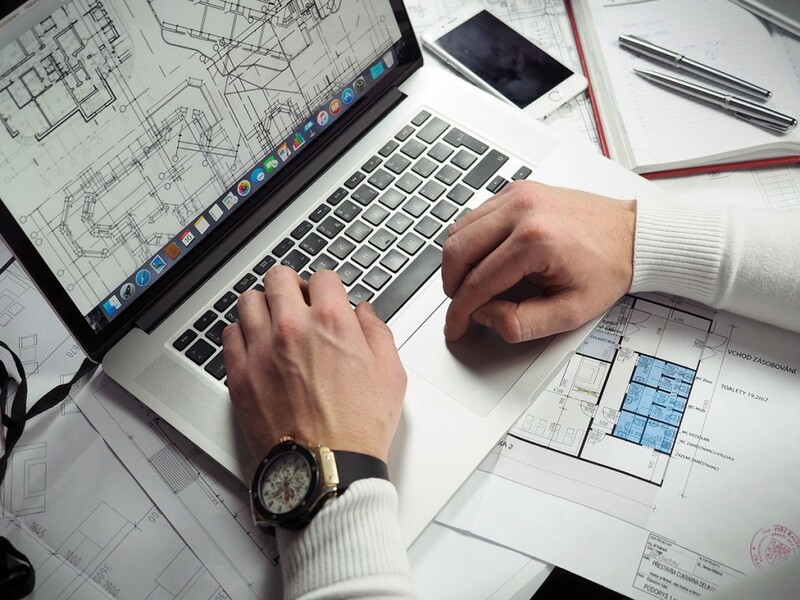 Furthermore, we believe that technologies can contribute to the development of different industries only when utilized by others. We strive to develop technologies for practical use. We look for research topics related to the upcoming needs of society, find new principles by thorough research and development, and invent technologies that solve problems (sowing). 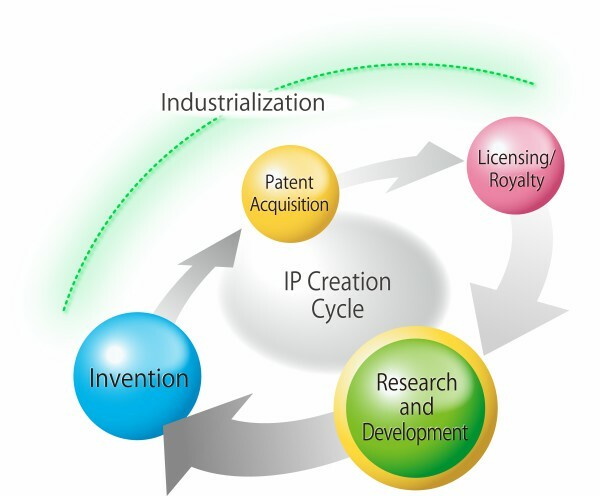 We concurrently obtain patents for those inventions to protect our intellectual property (cultivation), and receive recognition that our technology and inventions are indeed valuable, when our technology and inventions are used all over the world (fruition), thereby contributing to the industrial development and leading to our profits (harvest). The obtained profits are further invested into other R&D fields to create new technologies (re-sowing). This IP creation cycle which we are pursuing is an "agricultural" business model. A key strength of crystalline oxide semiconductor is an extremely low off-state current which enables the production of extremely low power devices. The crystalline oxide semiconductor is a technology which will be demanded in the AI era when a large amount of electricity would be consumed. The intellectual properties of SEL are highly valued all around the globe. 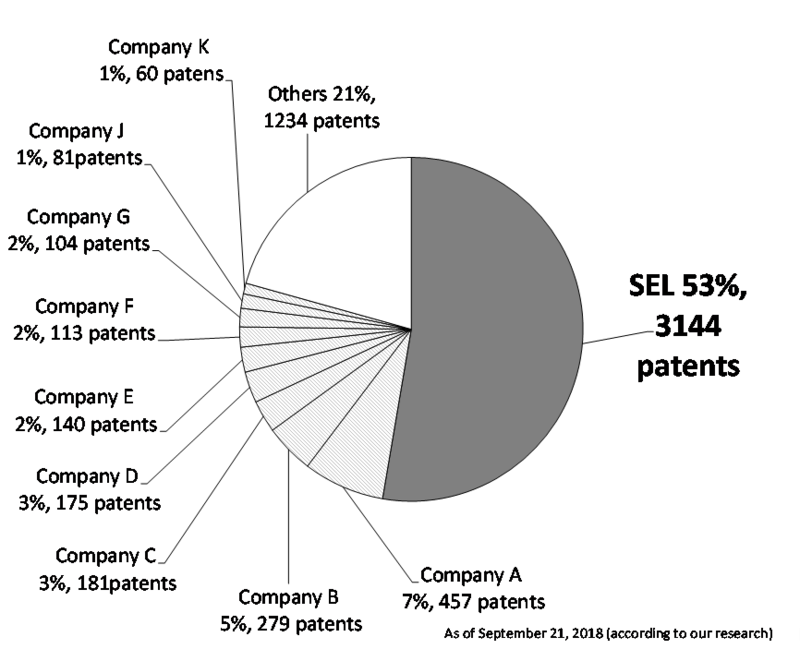 SEL ranks at one of the top positions in the semiconductor manufacturing sector in IEEE Spectrum Patent Power. 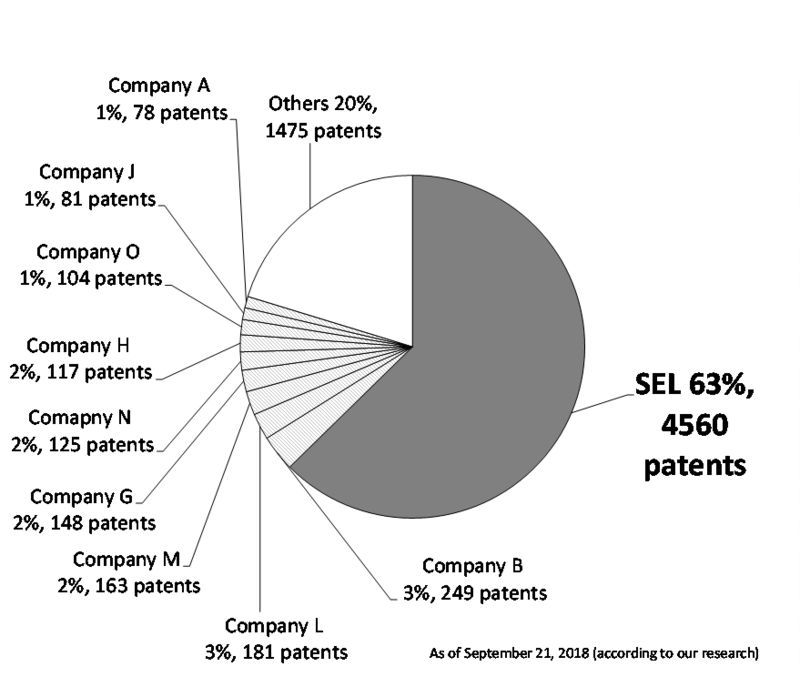 SEL possesses a large number of patents related to oxide semiconductor and the share of oxide-semiconductor-related patents exceeds 60% in Japan and is about 50% in the U.S. The most distinctive characteristic of a field-effect transistor using crystalline oxide semiconductor (OSFET) is an extremely low off-state current on the order of yAmm (10-24A/mm, at 85°C), which cannot be achieved by a silicon semiconductor. Its physical property, a current ratio of more than 20 digits between the on-state and the off-state, can dramatically reduce the power consumption of devices. The OSFET can be considered to be an excellent switch, as it has a very high on/off current ratio in a wide range of temperatures including high temperatures. This superb switch is an enabler of new memory devices and multiply-accumulate operation circuits used in AI. Devices using crystalline oxide semiconductor are extremely low-power device and essential for the AI era when enormous electricity would be consumed. We have a responsibility to create the technology that will protect the environment. We intend to distribute crystalline oxide semiconductor with extremely low off-state leakage current and replace silicon, the current mainstream semiconductor. By doing so, we hope to contribute to the environment and the future of humankind. President: Shunpei Yamazaki, Ph. 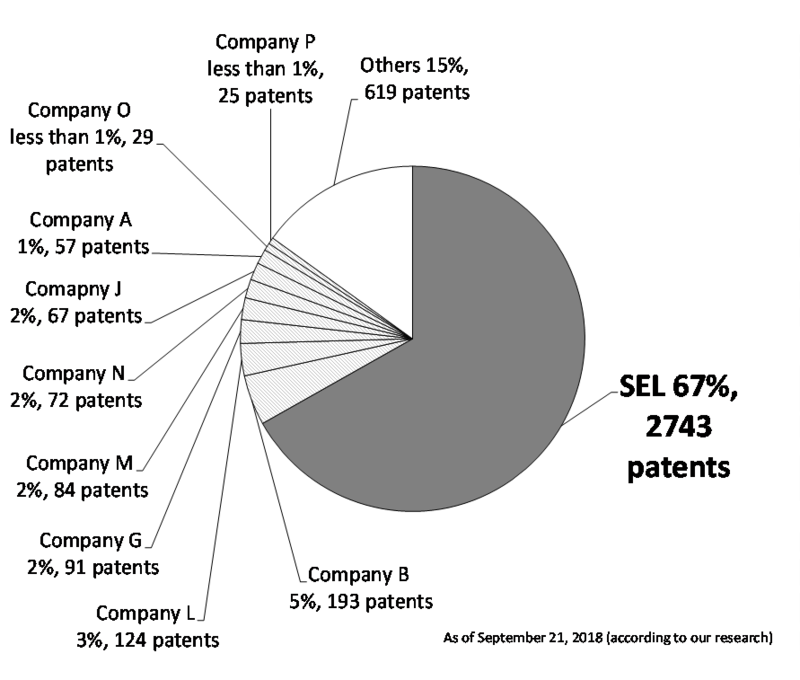 D.
SEL is one of the world’s most unique companies, which is managed solely on the benefits earned by R&D and intellectual property licensing through the IP cycle without receiving any government subsidies. Since its establishment in 1980, SEL has brought many innovative technologies to the world. In the 1980s, we researched amorphous silicon solar batteries to improve the photoelectric conversion efficiency and reliability of the batteries. In 1987, SEL participated in the 1st World Solar Challenge, which is a race held in Australia for solar-powered cars. The employees hand-built the car (named the "Southern Cross") using amorphous-silicon solar panels developed in-house. In the 1990s, we developed polysilicon TFTs for small- and middle-sized displays. SEL succeeded in developing the world’s first linear laser crystallization equipment and a continuous grain silicon whose mobility is higher than that of polysilicon. In the 2000s, we succeeded in the creation of 8-bit CPUs on glass (for LCD) and plastics which were the first in the world. We also succeeded in fabricating an active matrix OLED panel of green phosphorescence. In the middle of the 2000s, we focused on indium-gallium-zinc oxide (IGZO) as the next-generation semiconductor. In particular, SEL discovered a new structure, a c-axis aligned crystalline IGZO (CAAC-IGZO). The structure can drastically reduce off-state leakage current as compared to that of silicon. SEL utilizes this feature to develop extremely low-power devices. In addition, we started co-development with Sharp Corporation to apply IGZO to small- and middle-sized display panels and smartphones. This was first launched all around the world in 2012. For more information on our R&D history, please visit SEL’s website. *OSFET and CAAC-IGZO are registered trademarks of Semiconductor Energy Laboratory Co., Ltd. in Japan (Japanese trademark registration No. 5519759 and No. 5494218).